The guidelines are quite startling – they even include an “empowerment” section that suggests citizen juries be established or that options could be put to a vote (among who?) of which the results would be binding. Given criticism that LHIN consultations can often be leading and manipulative, the guidelines suggest that “open space meetings” be offered that allows the participants to set their own agenda. Imagine that! We actually did try that. In 2012 we invited the South West LHIN and the North West LHIN to meet with a diverse group of mental health staff. We arranged everything, including the room, a facilitator, and a significant number of willing participants. All they had to do was show up and take notes. North West did show up, South West failed to respond to our invitation – not even offering us the courtesy of a written reply. The NW LHIN said they would follow-up with another mental health meeting of their own calling. They never did. We did send them notes from our meeting. While we have responded to LHIN initiatives, it is very rare to ever be contacted by them about a specific initiative. We have spoken in more general terms, such as the generous offer to form labour committees in the Central East LHIN. Last I checked, we are still considered “organized labour” under the terms of the guidelines. 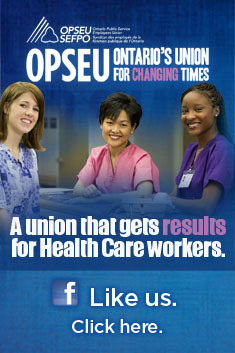 If any LHIN wants to consult us as a union, please call Rick at 416-443-8888 ext 8383. The guidelines also suggest looking a feedback mechanisms and response time – such as acknowledgement of receipt within 48 hours. As we have seen with our recent inquiry around transparency, some LHINs took weeks to get back to us. What isn’t included in the LHIN Community Engagement Guidelines is any reference to deputations to the LHIN board. Most LHINs have begun to do this – the Erie St. Clair LHIN leading the way with what is essentially an open mic time at their meetings. All you have to do is register at least 15 minutes before the beginning of the meeting to get your five minutes before the board. Central West LHIN will also offer you five minutes to depute. Applications are required five days in advance. Others that do offer an opportunity to depute are much more controlling and require periods of notice that make it next to impossible to address an issue on the agenda (agendas usually come out 10-days in advance). Almost all require presentations to somehow fit with their strategic aims, priorities or integrated health service plan. Mississauga Halton LHIN will set aside time for up to three 10-minute deputations per meeting. They require an application 15 days in advance, materials 10 days in advance. The Central East LHIN will set aside time for up to two 15-minute deputations per meeting. However, you have to work for it. The individual or group has to make an application to speak 30 days before the next board meeting. The application will be vetted and the Corporate Governance Coordinator will notify the interested party if they have been approved or not. Materials presented to the board must be similarly vetted. The Toronto Central LHIN has a similar process – also requiring 30 days’ notice. They do note that in the case of time-sensitive or emergency issues they can reduce that notice to five days. TC LHIN also states on their website that there is an additional opportunity to informally interact with the board members and staff after their board meetings. The North Simcoe Muskoka LHIN only requires 15-days’ notice, but you must submit all your written materials (including Powerpoints) with the application. The NSM LHIN will not allow you to present on something where the decision has already been made – in other words, no presentations asking for reconsideration. The Welland Tribune calls the Hamilton Niagara Haldimand Brant LHIN the least transparent, but at least they do have a deputation policy. You have to apply 15 days in advance, submitting your written materials at that time. The HNHB will give you 10 minutes, including time for questions from the board. They’ll take up to three presenters per meeting. The Toronto Central, Hamilton Niagara Haldimand Brant and North Simcoe Muskoka LHINs all restrict presenters from speaking about “matters of individual health system experience,” or in other words, don’t tell us how the system worked or didn’t work for you personally. While the North East LHIN does not make available opportunities for deputations to their board, you can actually request a board member to come to you. That’s like ordering a board member to go. We wonder if you get fries with that? All of these are very different from the open concept promoted by Erie St. Clair. With the majority of LHINs now offering some form of deputation, we have to wonder how long it will be before the other six follow. In recent weeks we have been following up on the Welland Tribune’s evaluation of how transparent the LHINs are when it comes to providing access to board materials beforehand. We’ve experienced what it’s like to attend a board meeting where a document is openly discussed without the ability of spectators to actually see it. It raises the question of whether a meeting is truly open if the spectators are denied access to information that makes the discussion comprehensible. We did hear from the last of the LHINs to respond. North West LHIN claim they never received our request. When we sent the e-mail out again showing its original January 6th date, they indicated that it was likely never opened because we forgot to change the subject line from the previous request, which read NE LHIN. Never mind the opening salutation was directed to the NW LHIN – evidently whoever received the e-mail never bothered to look at the first line. Access to documents is mixed at the NW – they prefer their board first approve documents before being released to the public, although they do say non-restricted documents are made available at the actual meetings. Seven LHINs – Central, South West, South East, Toronto Central, Central West, Mississauga Halton and Erie St. Clair all make more detailed documents available on-line in advance of their meetings. As the Standing Committee on Social Policy travels the province for the next three weeks reviewing the LHINs, they should take a serious look at how “open” meetings really are and what information the public should have in a timely manner. While it is easy to criticize the elaborate application process to depute before eight of the LHINs, let’s remember that six are still afraid to let the public come and speak directly to their boards. That likely tells you everything you need to know about their approach to public engagement. This entry was posted in Uncategorized and tagged Central East LHIN, Central LHIN, Central West LHIN, Champlain LHIN, Erie-St. Clair LHIN, Hamilton Niagara Haldimand Brant LHIN, Local Health Integration Networks, Mississauga Halton LHIN, North East LHIN, North Simcoe Muskoka LHIN, North West LHIN, South East LHIN, South West LHIN, The LHIN Spin, Waterloo Wellington LHIN. Bookmark the permalink. Hmmmmm…..Bob Hepburn in a recent article in the Toronto Star (http://www.thestar.com/opinion/commentary/2014/02/05/kathleen_wynne_fails_to_act_on_growing_healthcare_mess_hepburn.html) is suggesting that LHINs should take over from CCACs. But if the LHINs aren’t capable of being open and transparent (apparently the major failing of CCACs), then what makes them more qualified?